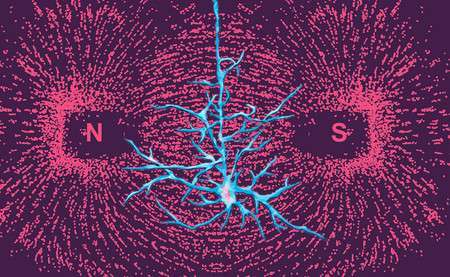 Caltech biologist Markus Meister is disputing recent research claiming to have solved what he describes as "the last true mystery of sensory biology"—the ability of animals to detect magnetic fields. This "magnetic sense" provides a navigational aid to a variety of organisms, including flies, homing pigeons, moles, and bats. In three separate papers appearing in journals published by the Nature Publishing Group, teams of researchers from Peking University in Beijing, the University of Virginia, and Rockefeller University in New York build a scientific case, based on the existence of particular iron-laden protein molecules, for how living cells might be affected by magnetic fields. If correct, these findings would help explain how animals sense magnetism and how cellular functions might one day be controlled using magnetic fields. An important property of iron is that it can be magnetized like the needle on a compass. Because the described proteins contain so much iron, the argument goes, they would be affected by Earth's magnetic field, providing a mechanism through which organisms could sense that field. The problem, says Meister, Anne P. and Benjamin F. Biaggini Professor of Biological Sciences, is that each of the proteins described in the trio of Nature papers do not contain enough iron to be affected by magnetic fields. "We're talking a disparity of between five and 10 orders of magnitude. The amount of iron in the molecules isn't even close to being enough," says Meister, who discusses his analysis of the three studies in a paper published by the journal eLife. That difference is enormous. Meister likens it to claiming to have built an electric car that could run for a year—on a single AA battery. After noting the issue, Meister checked in with colleagues in the field, including Joseph Kirschvink (BS, MS '75), Nico and Marilyn Van Wingen Professor of Geobiology at Caltech, who is known for work on magnetoreception based on magnetite (Fe3O4), a ferromagnetic iron ore. In 2001, Kirschvink published evidence that crystals of magnetite in animals may play a role in animal magnetic sensitivity. Kirschvink agreed with Meister's analysis. "Markus is spot-on," says Kirschvink. In one of the papers, published in Nature Materials in November 2015, a group led by Siying Qin of Peking University report the discovery of an iron-rich rod-like protein complex in the eyes of the fruit fly Drosophila that, the authors say, could be the source of the fly's magnetoreception. They named the complex MagR, for magnetoreceptor protein. MagR includes 40 iron atoms. These iron atoms, the Peking University researchers say, provide enough of a magnetic moment (movement in response to a magnetic field) that roughly 45 percent of isolated proteins orient with their long axis along the geomagnetic field. In other words, the paper suggests that the proteins align in response to Earth's magnetic field so that they point to magnetic north like the needle on a compass. However, Meister says that the proteins actually do not have enough iron content to be sensitive to magnetic fields. The smallest iron particles that are known to have a permanent magnetic moment at room temperature are crystals of Fe3O4, which are about 30 nanometers in size. Each crystal contains about 1 million tightly packed iron atoms. That means that even if all 40 iron atoms in a MagR protein manage to link up somehow and operate as a single unit, the protein's resulting magnetic moment would still be too small to align with Earth's geomagnetic field at room temperature. Magnetism is locked in a battle against the chaos-inducing energy of heat, which works to randomize the orientation of the protein complex. This thermal effect is about five orders of magnitude stronger than any magnetic pull on the 40 iron atoms. "This is back-of-the-envelope physics," Meister says. The other two papers—one in Nature Neuroscience by Michael Wheeler of the University of Virginia and one in Nature Medicine by Sarah Stanley of Rockefeller University—explore the possibility of engineering mechanisms that would use iron atoms in cells to control ion channels. Ion channels are gateways in cellular membranes that allow for the passage of ions across the membrane, thus transmitting signals into and out of the cell. These signals control cellular functions. For example, ion channels in nerve cells can transmit pain signals. Being able to selectively open and close ion channels with magnetic fields, rather than with medications, would offer clinicians a minimally invasive technique to control cells—for example, managing pain without the use of pharmaceuticals. Both Wheeler's and Stanley's findings hinge on the use of ferritin, a hollow protein shell that, previous research has shown, can be packed with iron. (Most organisms naturally produce ferritin to store iron, which is toxic when floating freely throughout cells.) Both groups attached a ferritin ball to an ion channel that resides in the cell membrane, with the goal of creating a mechanism for opening or closing the channel by manipulating the ball with magnetic fields. Wheeler proposed physically tugging on the ferritin ball with a magnetic field, while Stanley used a magnetic field to heat the ferritin and trigger the attached ion channel's opening and closing. Neither scheme can possibly work, Meister says. Indeed, Meister's calculations show that ferritin is too small by many orders of magnitude to be affected by magnetic fields. "In both cases, one can blame the choice of ferritin," Meister says. Since ferritin has no permanent magnetic moment, magnetic fields interact with it only weakly. "If the reported effects really occurred as described, they probably have nothing to do with ferritin." However, he suggests, there may be a viable route to controlling ion channel function in cells using much larger magnetic particles, like those found in certain magnetic bacteria. While missteps in science are common and indeed part of the scientific process—hence the need for peer-review for articles—Meister worries that these announcements could discourage other scientists from trying to understand the causes of magnetism in biological contexts. "It's like the brass ring has already been snatched," Meister says. "It's all too easy for someone to look at that and think, 'All right, I guess that's been answered. I'll try to tackle some other problem, then.'" Meister's paper is titled "Physical Limits to Magnetogenetics".